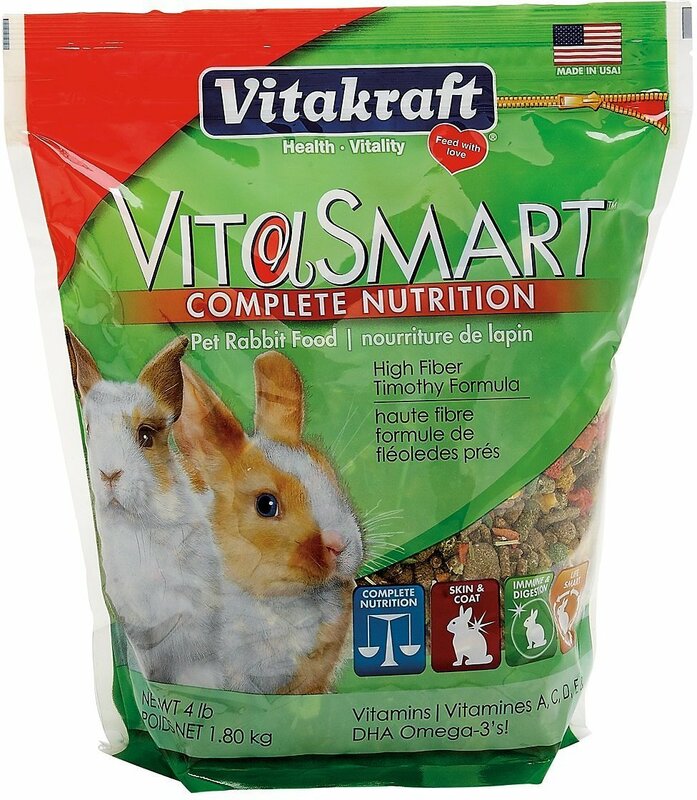 Feed your rabbit a super premium diet with VitaKraft VitaSmart Complete Nutrition Adult Rabbit Food. Rabbits require fiber from hay to aid in their digestive. VitaKraft VitaSmart Complete Nutrition Adult Rabbit Food provides a boost of fiber with Timothy grass hay as its first ingredient. It contains DHA and Omega 3 fatty acids and is specially designed to support complete health and well-being during middle age and maturity. Provides complete and balanced daily nutrition. Timothy Grass Hay, Soybean Hulls, Dehulled Soybean Meal, Flaked Corn, Wheat Middlings, Ground Corn, Flaked Peas, Dehydrated Carrots, Ground Wheat, Chopped Timothy Grass Hay, Carob Pods, Dehydrated Alfalfa Meal, Yeast Culture, Cane Molasses, Dried Plain Beet Pulp, Calcium Carbonate, Corn Gluten Meal, Ground Flax Seed, Dicalcium Phosphate, Monocalcium Phosphate, Salt, L-Lysine, Vegetable Oil, Wheat Germ Meal, Apple Juice Concentrate, Potassium Chloride, Magnesium Oxide, Vitamin A Supplement, Choline Chloride, Ground Steam-Rolled Oats, Dl-Methionine, Dried Lactobacillus Acidophilus Fermentation Product, Dried Lactobacillus Casei Fermentation Product, Dried Enterococcus Faecium Fermentation Product, Dried Bifidobacterium Bifidum Fermentation Product, Dried Aspergillus Oryzae Fermentation Product, Torula Dried Yeast, Yucca Schidigera Extract, Fructooligosaccharide, Algae Meal, Ground Papaya, Dehydrated Parsley, Vitamin D3 Supplement, Vitamin E Supplement, Niacin Supplement, Vitamin B12 Supplement, Riboflavin Supplement, D-Calcium Pantothenate, Menadione Sodium Bisulfite Complex, Biotin, Folic Acid, Thiamine Mononitrate, Pyridoxine Hydrochloride, L-Ascorbyl-2-Polyphosphate, Zinc Sulfate, Ferrous Sulfate, Manganese Sulfate, Manganous Oxide, Copper Sulfate, Potassium Iodide, Manganese Methionine Complex, Copper Lysine Complex, Zinc Methionine Complex, Cobalt Glucoheptonate, Cobalt Sulfate, Sodium Selenite, Color Added (Yellow 5 Yellow 6, Blue 1 Titanium Dioxide), Aloe Vera Gel Concentrate. Offer feed freely in a small bowl. Provide fresh food daily. Fresh water should be available at all times. Store unused portion sealed in cool, dry place. Finally, after trying several foods, my bunny really likes this food! I will definitely be ordering again. Thank you! It's like treats and a meal in one.. He ate all the big pieces first, saved the rest for later... Max also eats baby carrots. A special treat he loves are grapes!!! My Rabbit goes crazy for this! My bunny loves this food! I've tried lots of different ones, which he will eat, but this food seems to have more fiber for him. (I can tell by the size his droppings!) And he eats all of the morsels in it. Other food he would pick through and not eat all of it. My rabbit loves this food he is really picky but he gobbles this up. I really like the variety in this mix and that it includes the hay. My little bun buns love these pellets - they literally go crazy for them! I've tried a handful of different types of pellets and these are mine ( & the rabbits) favorite. My rabbits love this food. Ive never seen my girls so excited. I am definitely buying more of this food. Big pieces for adult rabbits. My bunny loves this mix that I have been feeding him for a year now. This is a new brand I decided to try for the Buns and she loves it. There are plenty of mix ins along with the traditional pellets. Of course, Buns leaves the pellets until last. This food also has a 15% protein content (17 is recommended) which is higher than many other brands. I'll buy this one again.